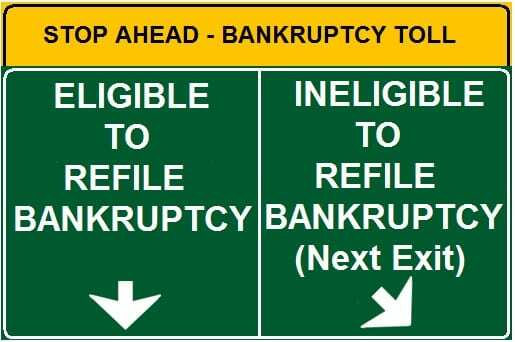 How Often Can You File Or Refile A Bankruptcy? For many, the question of whether they are eligible to refile a bankruptcy can arise if they have completed a bankruptcy in the past. The primary question is whether they are eligible to receive another discharge of debt in either a Chapter 7 or Chapter 13. This article deals exclusively with “consumer” bankruptcies Chapters 7 & 13. If you did not receive a discharge most of these rules for refiling do not apply. Other rules, such as whether you get immediate or continued protection from the “Automatic Stay” in a case, will be effected if you are reconsidering filing within a short period. The important point about refiling after a prior successful case is that you have to wait a certain period until you are eligible to receive another discharge of debt. The discharge is the order enforcing that any unpaid debt that is eligible to be eliminated under the Bankruptcy Code is eliminated. You need to be aware that you can file a Chapter 13 more often than listed below, assuming no abuse in the filing, but did not receive a discharge. Why would someone do that you ask? To put the bankruptcy protection in place to halt foreclosure, garnishments, repossessions and many other collection techniques that would devastate their life without such protection. These calculations are not actually about how often you can refile but how often you can receive a discharge depending on the time between filings. The calculations of the following time periods are from time of filing of prior case to time of filing of the new case. Many people mistake that it is from time of discharge of the first case to the time of refiling to the second case. This is incorrect. However, if you make that mistake you have generally over estimated the time need so it shouldn’t hurt you. Chapter 7 Bankruptcy Followed By Chapter 7 Bankruptcy– If you need to file for Chapter 7 bankruptcy after you have filed a previous Chapter 7 bankruptcy and received a discharge, then you need to wait 8 years between dates of filing. If you file prior to the 8 years, you will be denied a discharge. Chapter 7 Bankruptcy Follow By Chapter 13 Bankruptcy – If you need to file for Chapter 13 bankruptcy after your have successfully received a discharge in a prior Chapter 7 bankruptcy then you need to wait 4 years to obtain a new discharge. Short of four years from a prior Chapter 7 to the filing of a Chapter 13 you can still file and gain the protection. However, any unpaid debt at the end of the Chapter 13 will still be owed. Chapter 13 Bankruptcy Followed By Chapter 13 Bankruptcy – If you have previously filed a Chapter 13 bankruptcy and you successfully completed the plan and received a discharge the time limits for filing another Chapter 13 in order to receive a discharge is two years. Chapter 13 Bankruptcy Followed By Chapter 7 Bankruptcy – If you received a discharge in your previous Chapter 13 bankruptcy and file a Chapter 7 bankruptcy, you will need to wait 6 years from the date of filing your Chapter 13 bankruptcy to receive a full discharge. The only exception to this rule is if you paid your unsecured creditors 70% or more during your previous Chapter 13 bankruptcy. Another way of putting this is you do not use your Chapter 7 eligibility to refile immediately if you complete a Chapter 13 plan paying at least 70% of your unsecured claims. Please note that converting a case in many instances may leave you ineligible to receive a discharge in the converted chapter. In some circumstances, a second filing may be beneficial even though you will be ineligible for a discharge. Filing a Chapter 13 case immediately after getting a Chapter 7 discharge, which is commonly referred to as a Chapter 20 bankruptcy, can be advantageous. Recently case rulings in Virginia at the time of this blog hold that a second lien, mortgage, or equity line can be stripped off a home in a Chapter 20 even though a discharge in the Chapter 13 will not be received. For more details on whether a Chapter 20 should be considered, contact one of our experienced attorneys. If you did not receive a discharge in the first bankruptcy case, in most cases, you can refile immediately either a Chapter 7 or a Chapter 13. If the first case was dismissed, your can refile immediately unless the court has barred the refiling. In some instances a 180-day waiting period may apply if your case was dismissed for failure to obey a court order, failure to appear in the case, or you voluntarily dismissed the case after a creditor filed a motion for relief from the bankruptcy stay. If your discharge was denied in your first case, you should speak with an attorney before refiling. NOTE ON INTERNET RESEARCH: The rules explained in this blog changed on October 17th, 2005. Information on the internet pre-dating that time do not apply. Do not use the internet to determine bankruptcy rules and eligibility. Consult an attorney. If you found this blog informative we would appreciate if you would click the Google+1 button at the top to help others find the article on the web. The information provided in this blog is for general knowledge only. You should consult and attorney when considering filing or refiling a bankruptcy. Many other restrictions may apply which your are not aware of. Please contact our office for a free consultation with one of our experienced lawyers by calling tel:800-662-8813.